Pickup location: MSU Extension 963 S. Raisinville Rd, Monroe on Tuesday, June 18 from 3:30 – 6:30. 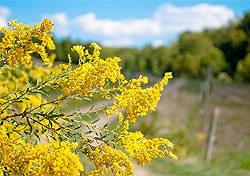 Native Plant orders may be placed with your Tree Order, or by Monday, June 10. Click on any iamge to see a larger view. 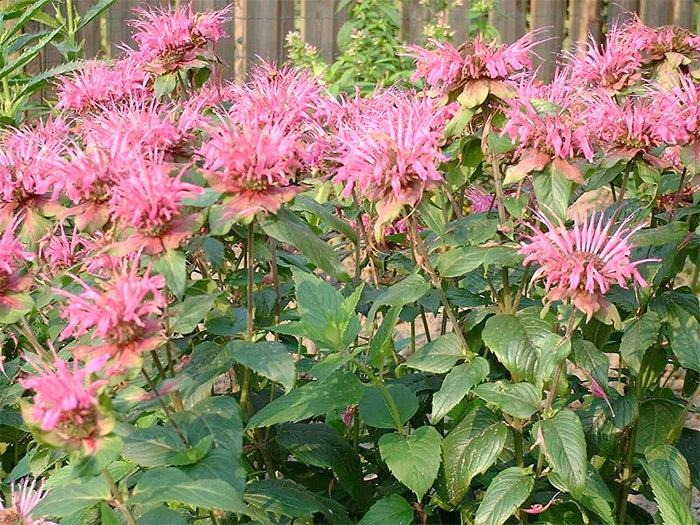 Bergamot Monarda fistulosa: Flowers that appear July through September are pink to lavender. One inch long tubes cluster together in dense but ragged heads that may be 1 ½ inches across. Sturdy erect stem can grow to 5 feet tall. Leaves and stems have a minty aroma. Partial shade, rich, moist soils. Commonly found along edges of woods and on roadsides as well as in old pastures. 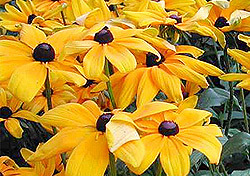 Black-Eyed Susan Rudbeckia hirta: Golden yellow petals surround a slightly raised conical brow disc. 1 to 3 feet tall. Blooms June – October. Dry to medium to somewhat moist soils. Full sun to dappled shade. 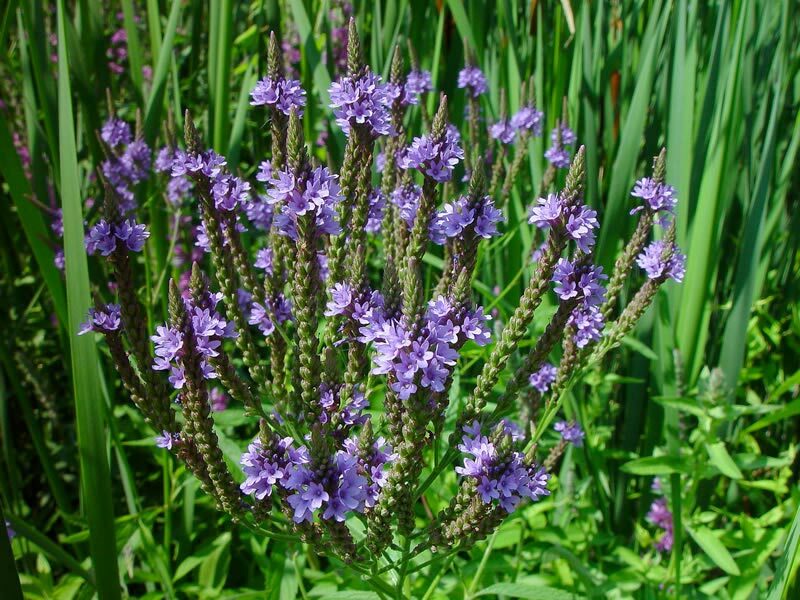 Blue Vervain - Verbena hastata: Good for sunny meadow and prairie garden. 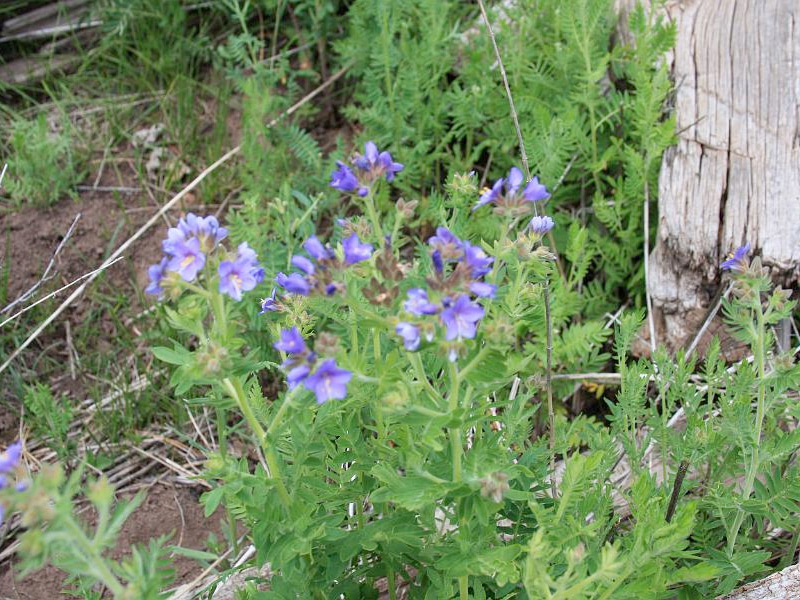 Spikes of small purple-blue flowers appear in mid summer. Prefers moisture but will do well in dryer areas. 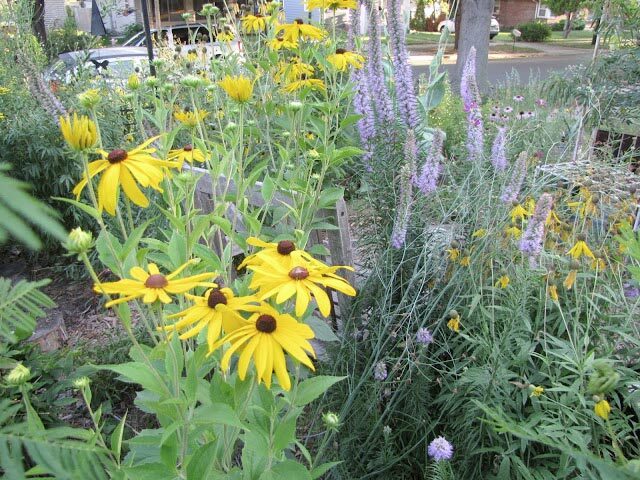 Will grow 3 to 5' tall in full sun to partial shade.Supplies nectar for butterflies. Deadhead to prolong flowering. Boneset - Eupatorium perfoliatum: The leaves of boneset are rather coarse, surrounding the stem and growing straight out, horizontally; they are rough, hairy and sort of crinkly. 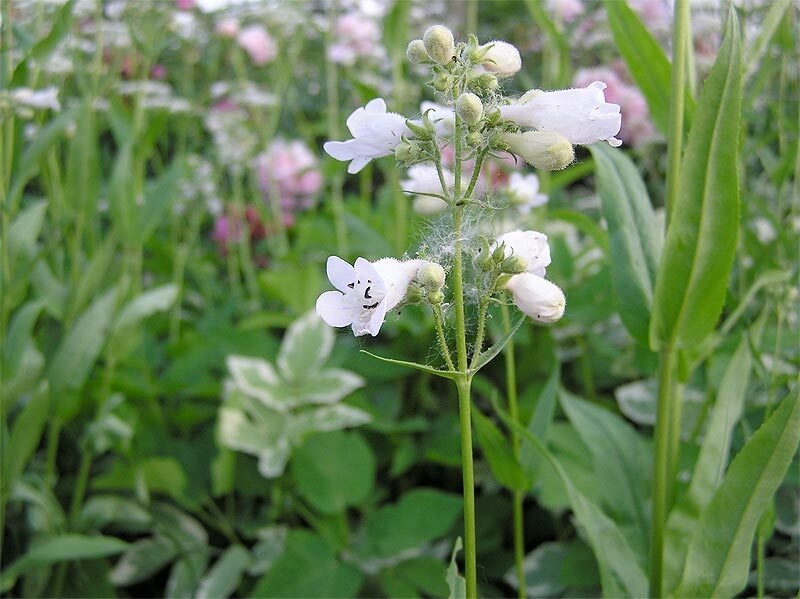 But the flowers are attractive in large clusters of long-lasting white blooms form summer through to autumn. This plant looks especially good near the back of the border in a large clump. Its strong stems never flop and thus it can be used to support weaker-stemmed growers, such as sky blue aster. Prefers moist conditions but will do just fine in average soil, as long as it gets sun. Give it lots of room as it will fill in large areas to dramatic effect. 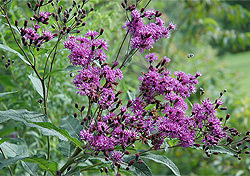 Good companion plants are spotted Joe Pye weed and fall blooming asters, such as New England aster and stiff goldenrod. 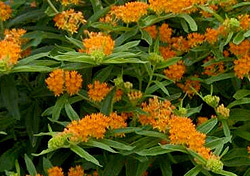 Butterfly Weed Asclepias tuberosa: Found throughout tall grass prairies in dry open areas, and along country roads. Flowers from June to September. The stout, simple or terminally branched stems are generally clumped and may be up to 2½ feet tall. Rough pointed leaves alternate along the stem. 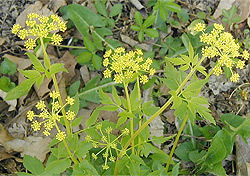 The flowers are normally bright orange with many individual flowers in a head. 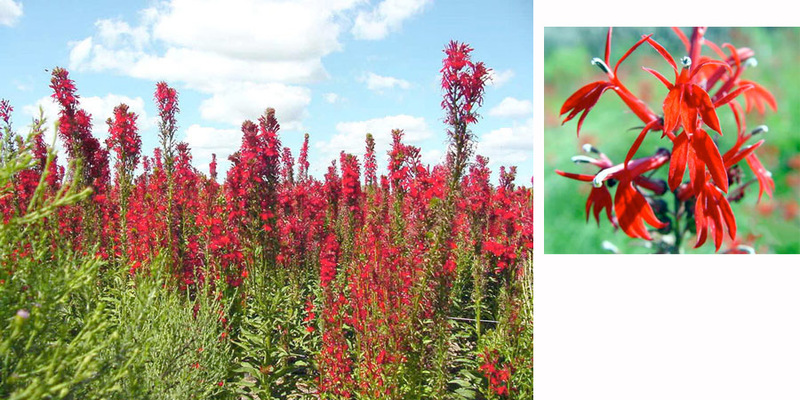 Cardinal Flower - Lobelia Cardinalis: Cardinal flower with its brilliant red blossoms is very attractive to butterflies and hummingbirds. It grows best in moist, even wet soil in light shade to full sun. Once established, it usually will re-seed itself. 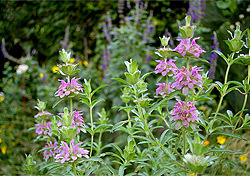 Provides late summer bloom to the perennial border, wild garden, native plant or woodland garden. 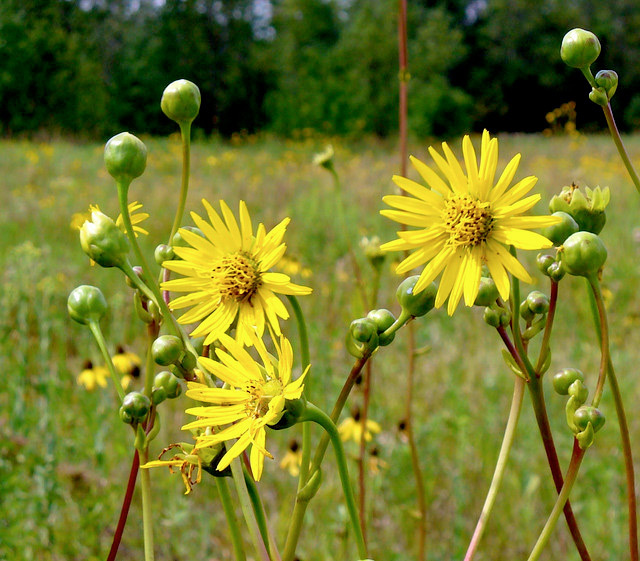 Compass plant - Silphium laciniatum: Found on mesic prairies, blooming July through August. 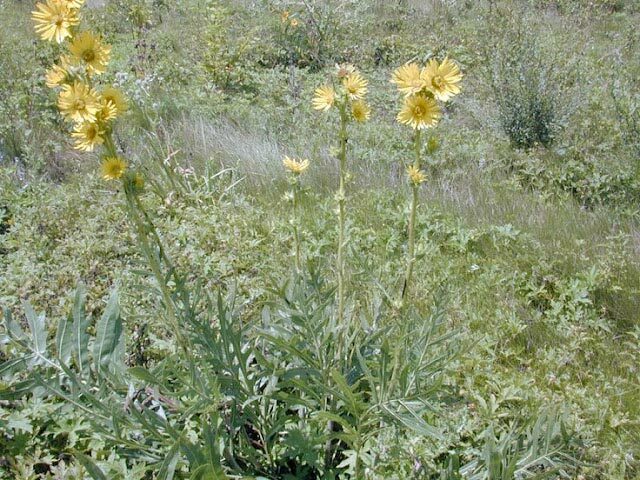 Growing from a thick, deeply penetrating taproot, the compass plant may reach a height of 8 feet. The leaves grow to one foot long and six inches wide. 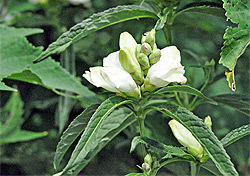 The irregularly lobed basal leaves tend to orient themselves in a general north-south direction, hence, the common name. 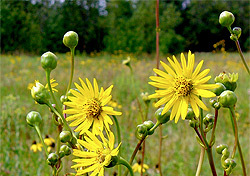 Yellow ray flowers, numbering 20 to 30 per head alternate up the stem, are up to 2 inches long. 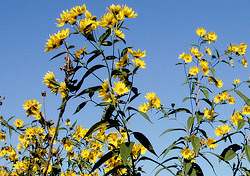 They resemble those of a wild sunflower and contribute to the late season show of color on the prairie. 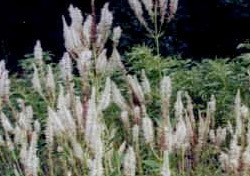 Culver's Root Veronicastrum virginicum: A particularly distinctive plant, Culver's Root is prized for its well-defined, clean lines. 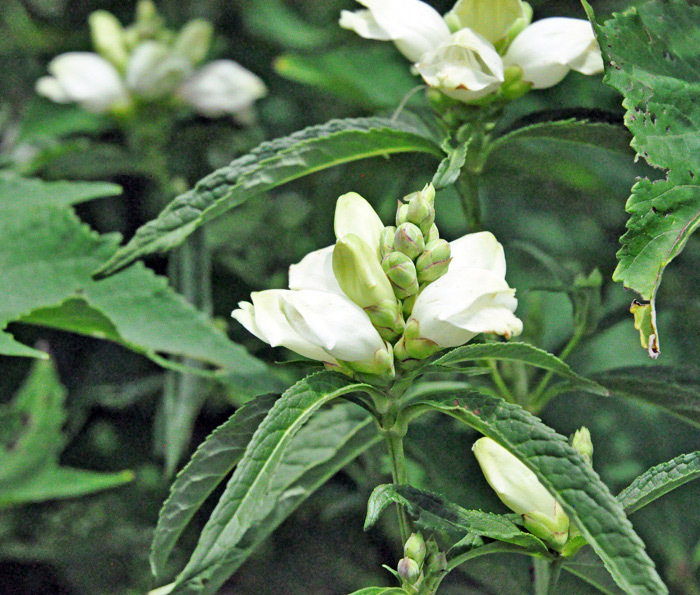 The elegant white flower stalks rise like spires above the whorls of deep green leaves in July and August. Growing 3 to 6 feet tall, it creates a unique background when planted behind shorter species. Does well in any medium to moist rich soil, in sun or light shade. 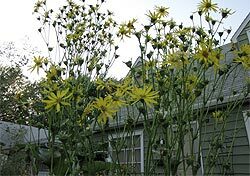 Cup Plant - Silphium perfoliatum: Requiring nothing in the way of care, can grow to 9’ in thick-stemmed clumps with abundant yellow flowers. Everything about this plant is dramatic: large leaves clasp the stem, creating a fascinating water retaining vessel that gives this plant its name; its prolific yellow blooms last well into autumn; the stem is thick and almost square. To keep your garden from turning into a cup plant plantation, you’ll need to weed out volunteers. Tolerates clay soil and drought. Deep roots make it difficult to transplant when mature. Hummingbirds and butterflies are attracted for the nectar, birds for the seed. 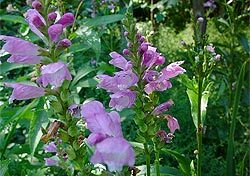 False Dragonhead (Obedient Plant) - Physostegia virginiana: Found in a wide range of conditions, from moist to average soil, full sun to partial sun. It spreads well, creating a bushy clump. Flowers are pink arriving in August. 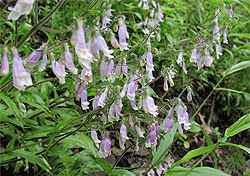 Foxglove Beard Tongue - Penstemon digitalis: Elegant clusters of pure white flowers decorate this showy plant. Growing to 2 to 3 feet, it does best on medium soils in the open or in light shade. Blooms in June. 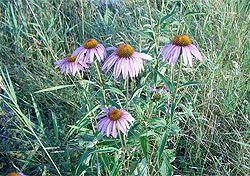 For the open woodland garden or in the prairie of meadow garden, blooming before the great bulk of prairie natives begin their show. 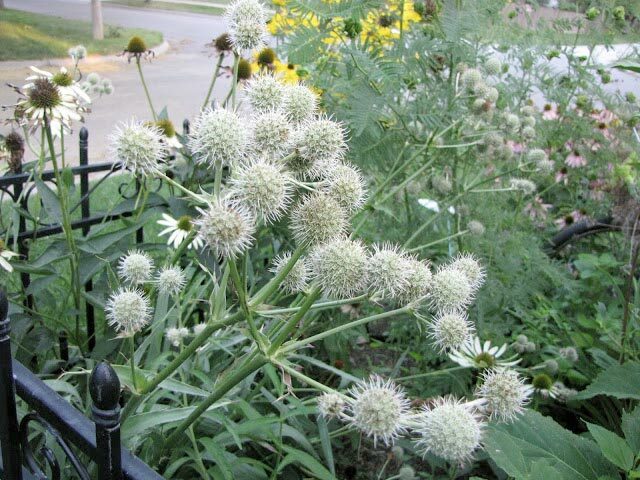 For the best effect, plant a couple of beardtongues together rather than isolating single plants here and there, you’ll have a sea of white blooms in early summer. A lovely addition to fresh arrangements. 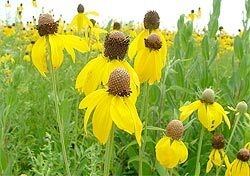 Gray Headed Coneflower - Ratibida pinnata: This prairie native produces large pale-yellow petaled flowerswith an elevated, cone-like center with shades from gray to light purple. Leaves arranged alternately along a tall, stout stem. Height: 3-5 ft. Blooms: June-August. Soil: well drained to drought. Full sun. Golden Alexanders - Zizia aurea: In the spring an airy displays of small bright yellow flowers, borne in slightly domed umbels, then throughout the summer, when its dry seed heads turn a beautiful purple (resembling dill seed pods). Leaves a deep rich green divided into threes are also quite attractive. 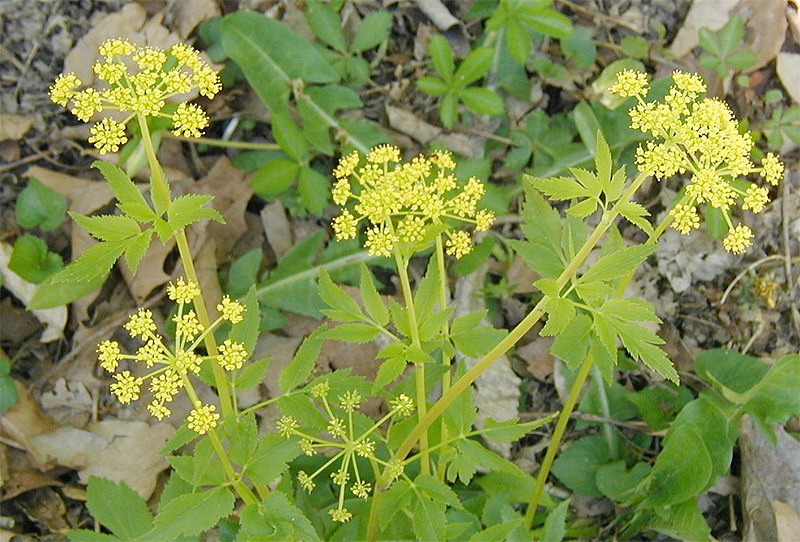 A versatile plant, golden alexanders does well in moist to dry soil, full to partial sun, and acidic to neutral soil. It spreads well on its own (can become invasive). 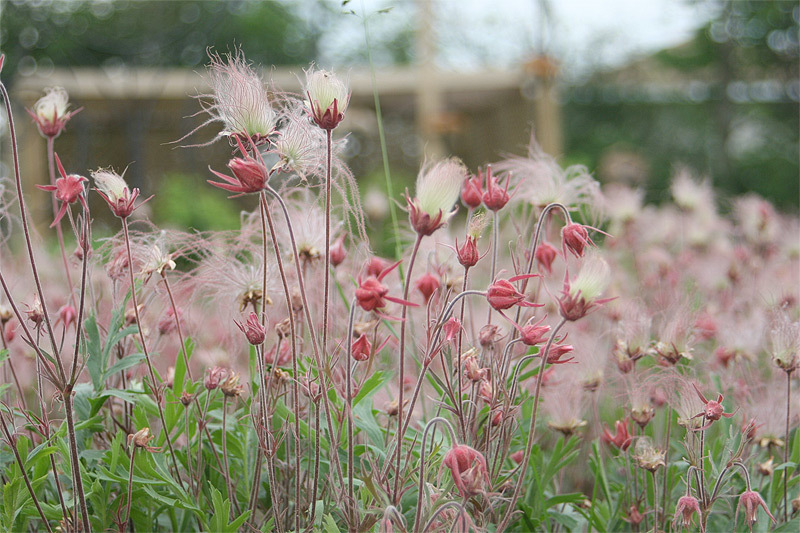 Good companions are with prairie smoke and Canada anemone. 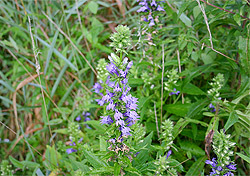 Great Blue Lobelia = Lobelia siphilitica: Late summer enjoy blue tubular flowers flaring into 2 lobes at the top of the blossom. Flowers cover the thick, tall growing spike that looks particularly dramatic in clumps. 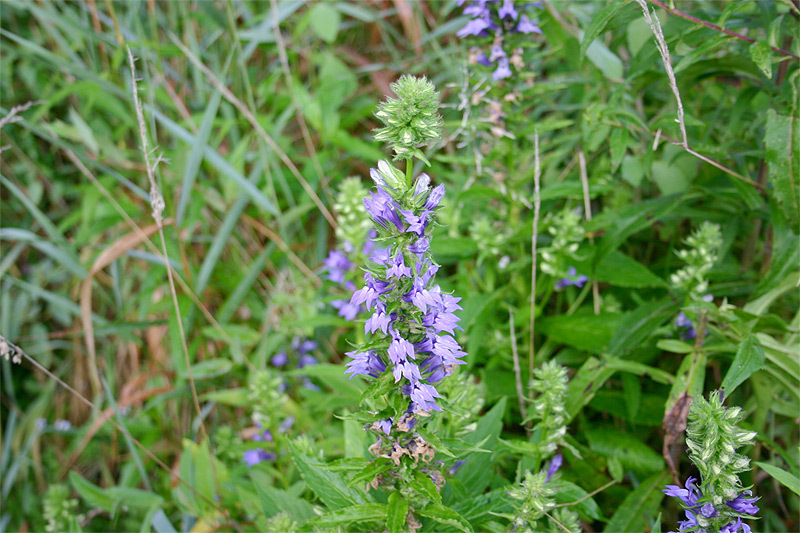 Moisture is the most important requirement of great lobelia, don’t let the soil dry out. In average soil conditions you may need to water occasionally, other than that it’s quite versatile, growing in sun to partial shade, slightly acidic to neutral soil. Mulch to conserve moisture and replenish the soil with compost in the spring. Hairy Beard Tongue - Penstemons hirstus: Tubular flowers up to 1 inch long pale lavender with whitish tips. 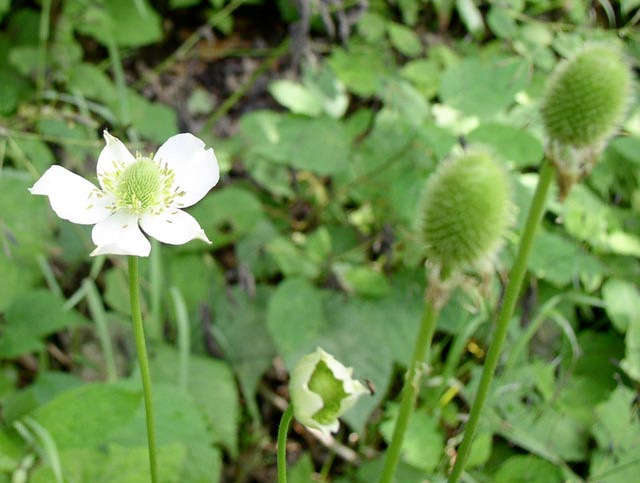 Grows 1 to 3 inches in open woods or rocky hillsides. 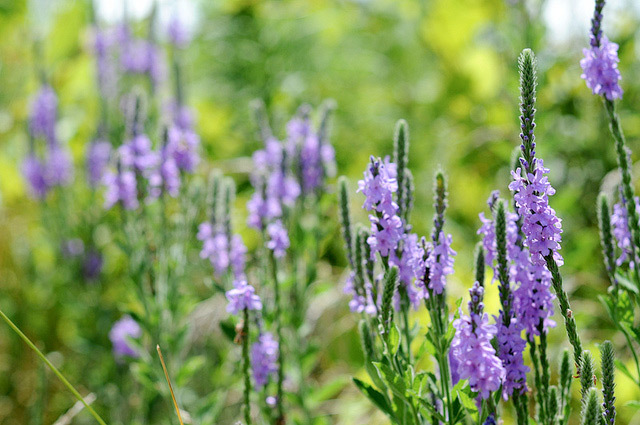 Hoary Vervain - Verbena stricta: This drought resistant plant grows on dry sandy soils to a height to 2 to f feet. Blooming during the heat of August. 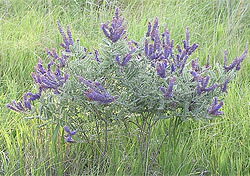 The long lavender flowerstalks stand out brilliantly and bloom for many weeks. 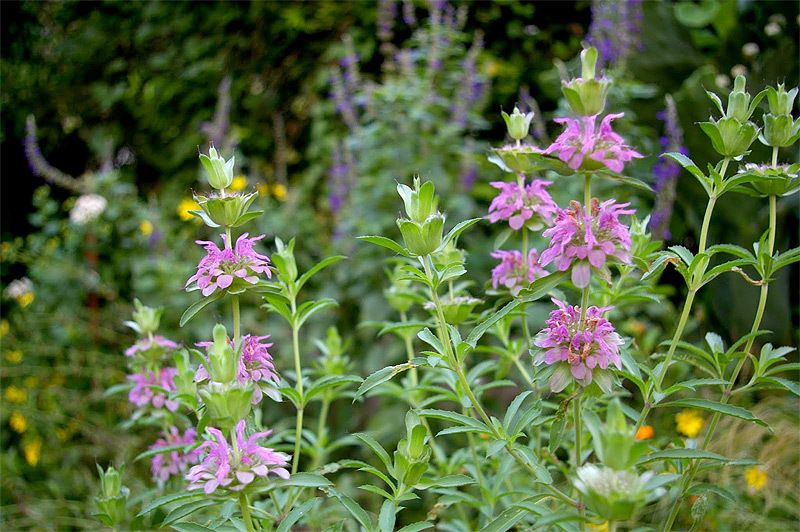 Horsemint - Monarda punctata: Grows 1' to 3’ tall with long narrow leaves. The flowers are yellow spotted with purple appearing in a ring. Most dryer soils, full sun. 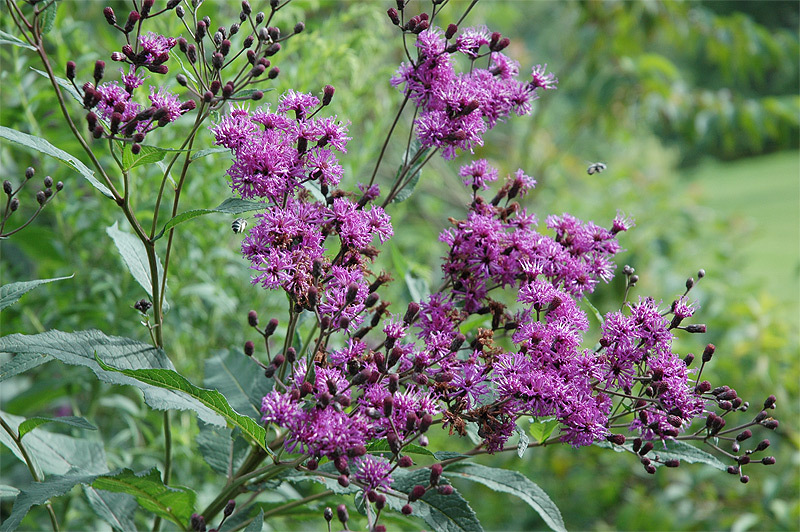 Ironweed - Vernonia missurica: Ironweed’s bright reddish-purple flowers resemble those of its well-known relative, Joe Pye Weed. Named for its tough fibrous stem, it grows in almost any moist to medium soil. A good plant for adding color too hard to landscape areas. Grows 3' to 6' tall. Jacob's Ladder - Polemonium reptans: The foliage alone is a good enough reason to plant Jacob’s ladder: numerous paired leaflets form a kind of ladder. 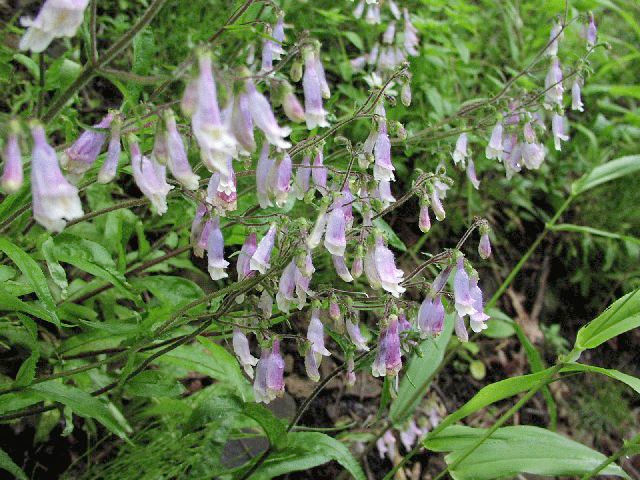 The flowers are also attractive, abundant violet-blue bells that cover the plant, in the right conditions it will spread quickly, forming ground-covering carpets. Prefers rich soil, full of organic matter, and does well in slightly acidic to neutral conditions in filtered sun to shade. 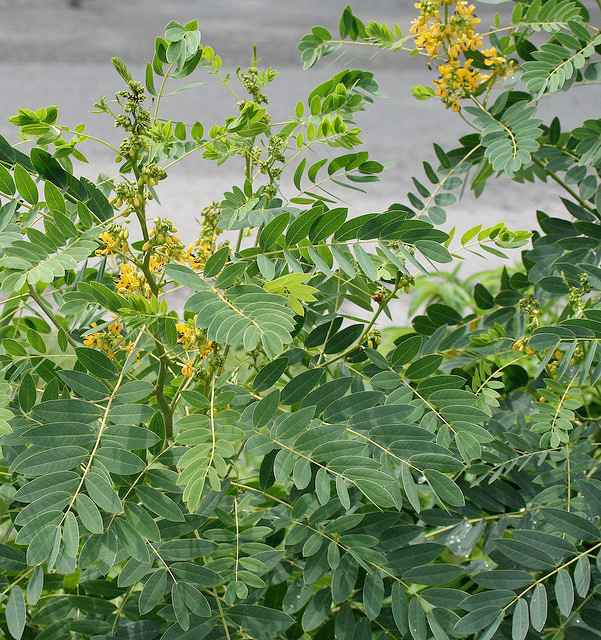 Height: 1 to 1 ½ feet, blooming spring to early summer. 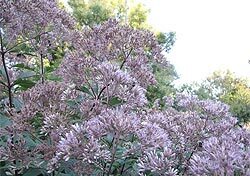 Joe Pye Weed - Eupatorium maculatum: The extravagant Joe Pye Weed is crowned with large flat-topped clusters of pale purple flowers in late summer. 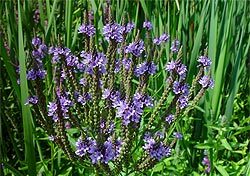 This inhabitant of wet meadows and thickets will grow luxuriantly in any rich garden soil, reaching a height of 6 to 8 feet. Bumblebees and butterflies are fond of roosting on the flowers. 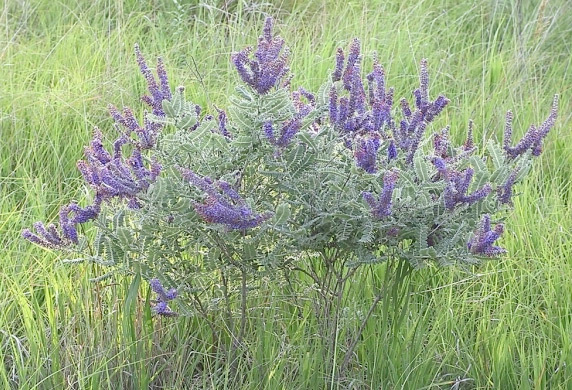 Lead plant - Amorpha canescens: This shrubby perennial grows to 3' tall in dry, sandy soils. 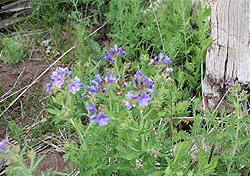 Tiny purple flowers are in a spike-like mass along the upper 2 to 7 inches of the stems. 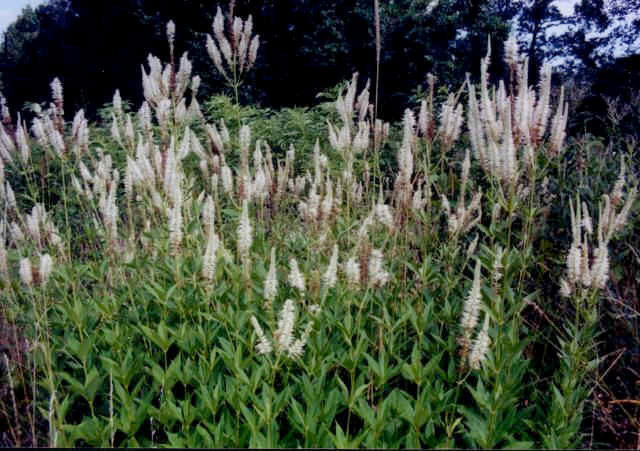 The entire plant is hairy, so much so that is has a whitish appearance. 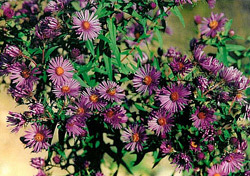 New England Aster Aster novae-angliae: This native wildflower is our most showy aster with small flowers spreading atop a cluster of green foliage. 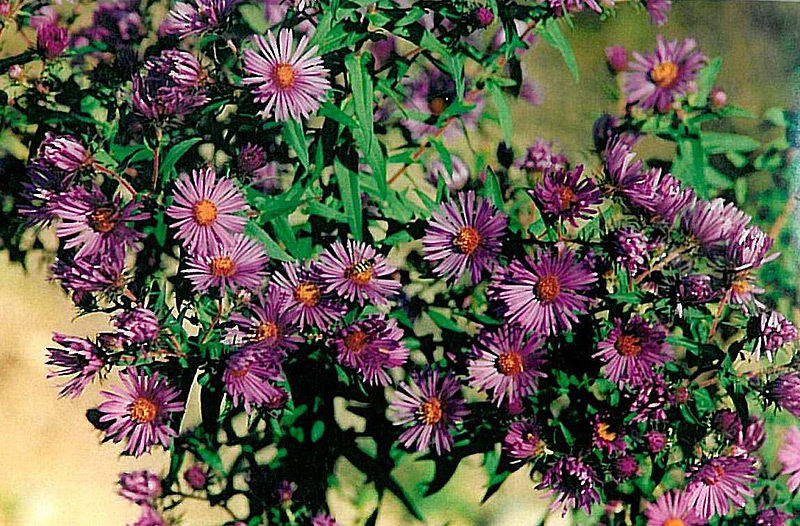 Flowers range in color from deep violet to magenta and are excellent fall plants for butterflies. 2 to 7 feet tall. 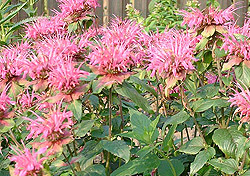 Blooms August – October in average to somewhat poorly drained soils. Full sun to somewhat shade tolerant. 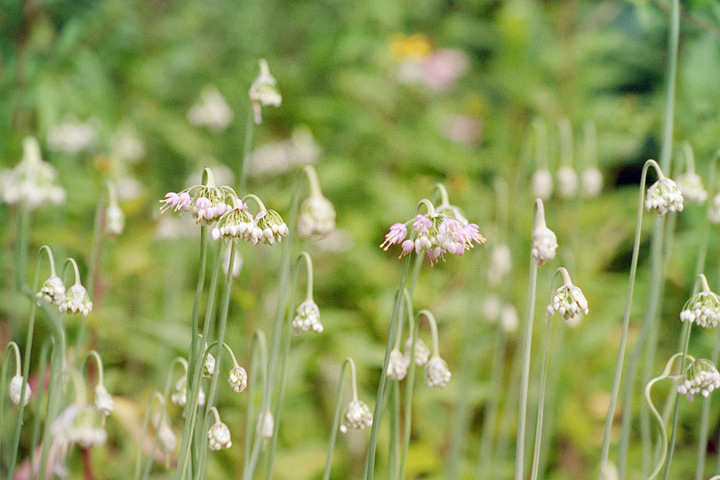 Nodding Wild Onion - Allium cernuum: Its grass like ribbony leaves are long and graceful; its flower cluster hangs down, covered with a fine onion-skin-like sheath before opening. 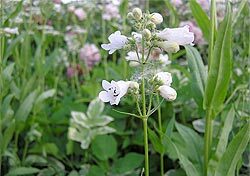 The blooms in mid-summer are whitish rose colored and bell-shaped, and its seed heads are round. Planted in groups around the edges of flower beds, it’s a charmer. 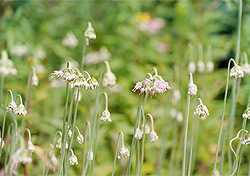 Nodding onion grows in a wide range of conditions, from sun to partial sun, moist to dry soil, acidic to neutral, rocky to rich. Prefers good drainage, so mix some sand into heavy soil. 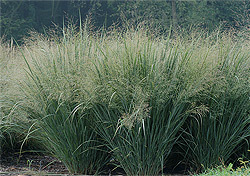 Good companion plants are lead plant and prairie dropseed grass. 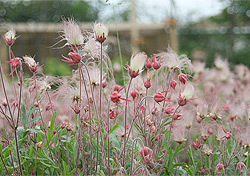 Prairie Smoke - Geum triflorum: Pictured are the feathery plums of seed heads of the Prairie smoke. 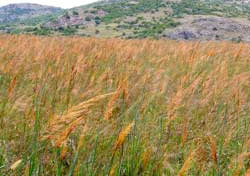 The plant is well adapted to dry areas and so is a good one for areas where water conservation is needed. Long feathery leaves grow from the base. Separate flower stalks topped by drooping, purplish flowers. 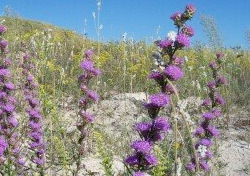 These are found in prairies and dry, rocky meadows, growing 8 to 18 inches tall blooming April through June. Full sun, average organic content. There must be good drainage around the roots. Spreads by rhizomes and can form crescent-shaped clumps. 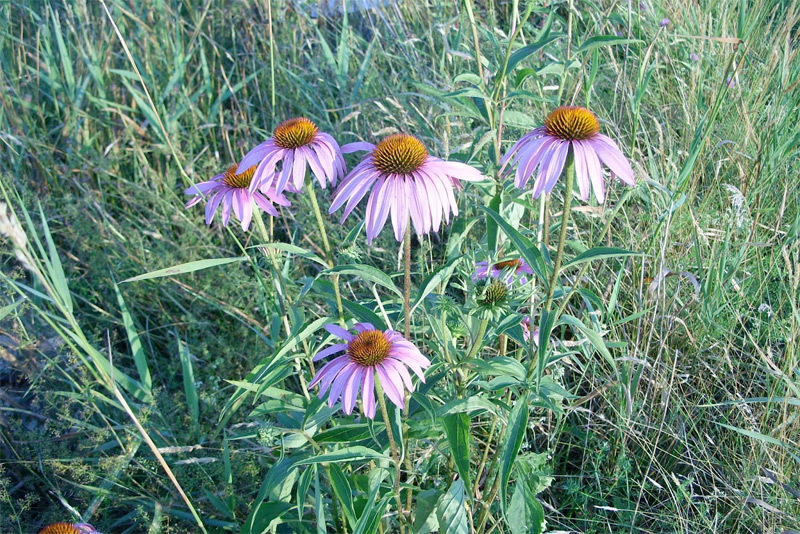 Pale Purple Coneflower - Found in dry open woods, growing in clay to sandy soil, full to partial sun.Blooms May to October. Deadhead to prolong blooming. 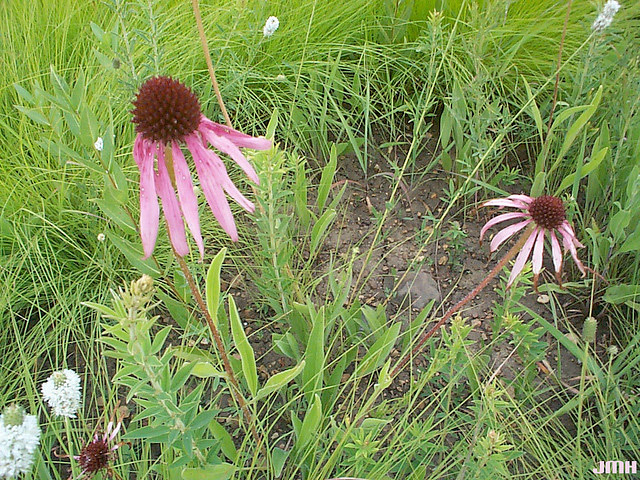 The Pale purple coneflower is more elegant than the purple coneflower. 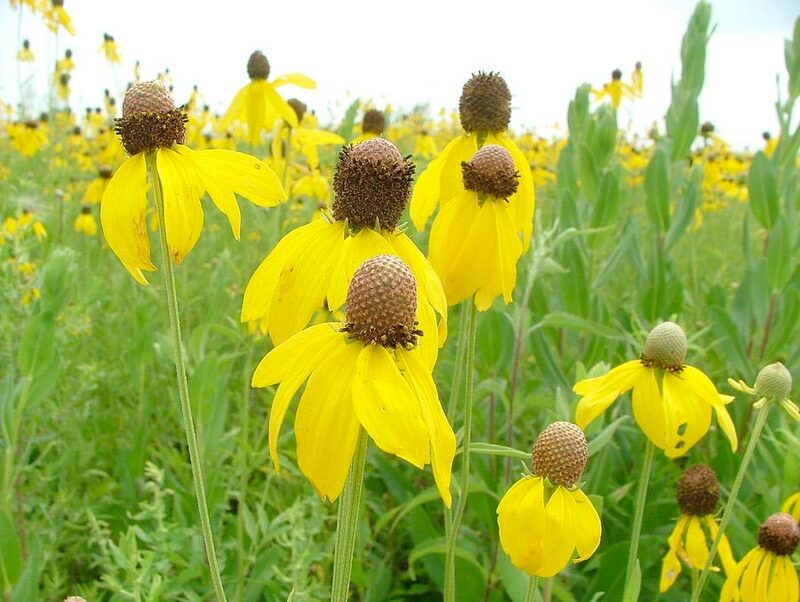 Growing 3 feet tall, its petal-like ray flowers are narrower than purple coneflower and a bit longer in their droop. 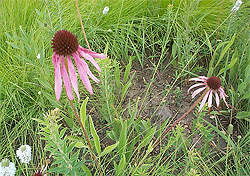 Purple Coneflower - Echinacea purpurea: This coneflower grows 2 to 5 feet tall blooming summer to fall. A very popular, dependable, low-maintenance, show plant with a long blooming season and no pest problems. Each flower goes through an attractive and lengthy transformation staring out pale pink with thin turned down petals, then gradually turning a deeper purple, getting bigger and the center cone becoming burnished-copper colored. If you deadhead spent blooms, you will have flowers from early summer through to autumn. Soil compatibility is versatile, growing in clay to sandy soil, full to partial sun, acidic to neutral to average to dry conditions. 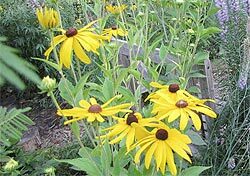 Good companion plans are Black-eyed Susan, showy goldenrod and yellow coneflower. 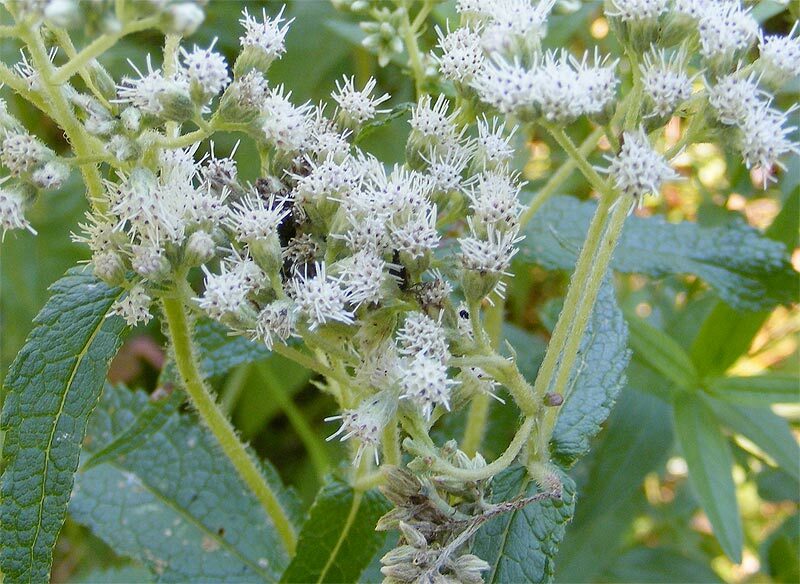 A great nectar plant for butterflies and hummingbirds. Small birds will eat the seeds leading into winter. A larval host plant for the Ottoe skipper butterfly. 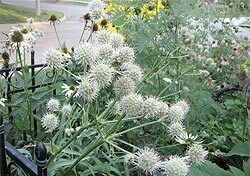 Rattlesnake Master - Eryngium yuccifolium: Notable for its excellent yucca-lick foliage, this unusual plant creates tremendous interest in the landscape. 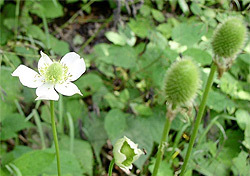 The unique white “flower balls” appear in July and August on long stalks. Native Americans brewed a tea of the root and drank it as an antidote for rattlesnake venom. Does best n medium and dry limy soils, reaching a height of 3 to for feet. 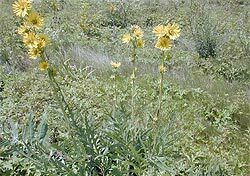 Rosinweed - Silphium integrifoliium: The shortest of the Silphiums, Rosinweed grows 2 to 6 feet tall. 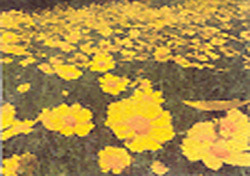 Its bright yellow flowers resemble large daisies and are produced in profusion. Grows easily on a wide variety of soils. A biannual. 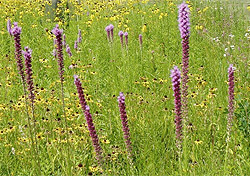 Rough Blazing Star - Liatris aspera: August – September these tufted flower heads composed of dozens of bright pink filaments range up and down the 3 foot tall flower stalks. Great for butterflies while the seeds are a good food source for songbirds. 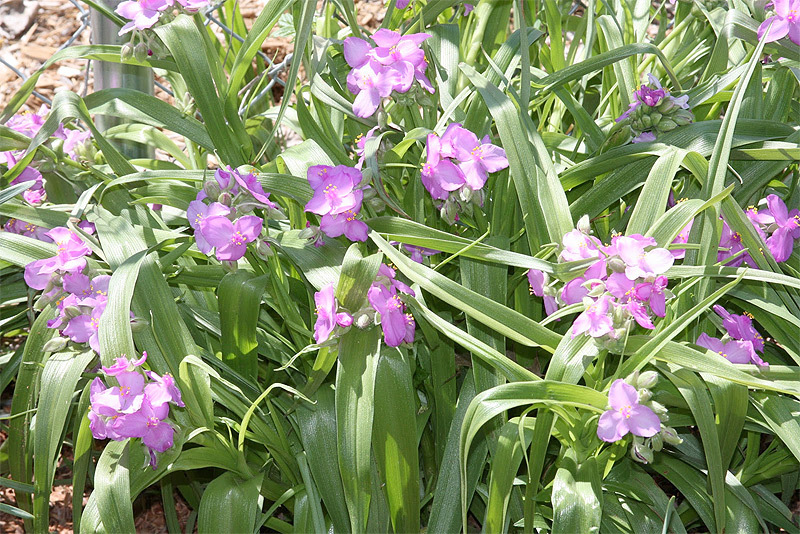 Prefers dry sandy soil but will grow in any well-drained soil. Full sun. 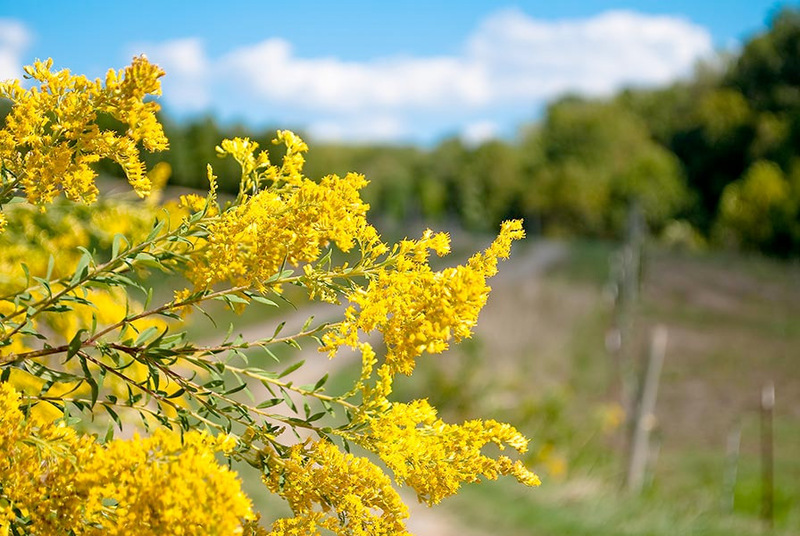 Showy Goldenrod - Solidago speciose: Prefers average, well-drained soil such as sandy or loamy. Rich soil may lead to rampant spread and floppy growth. 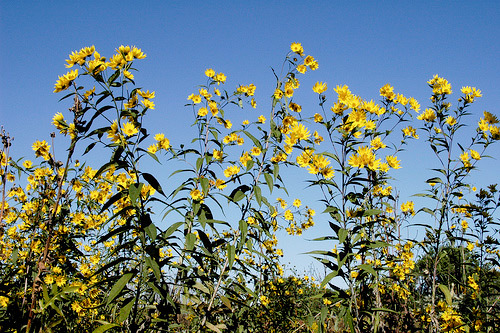 Showy Goldenrod produces conical spires of bright golden flowers in September and early October 2 to 6 feet tall. Full sun. 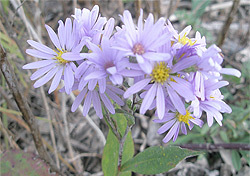 Sky Blue Aster - Aster azureus: Sky Blue Aster’s brilliant blue flowers mirror the autumn sky, covering the prairie with an azure blanket. The deep greenish-blue arrow shaped leaves are distractive in themselves. 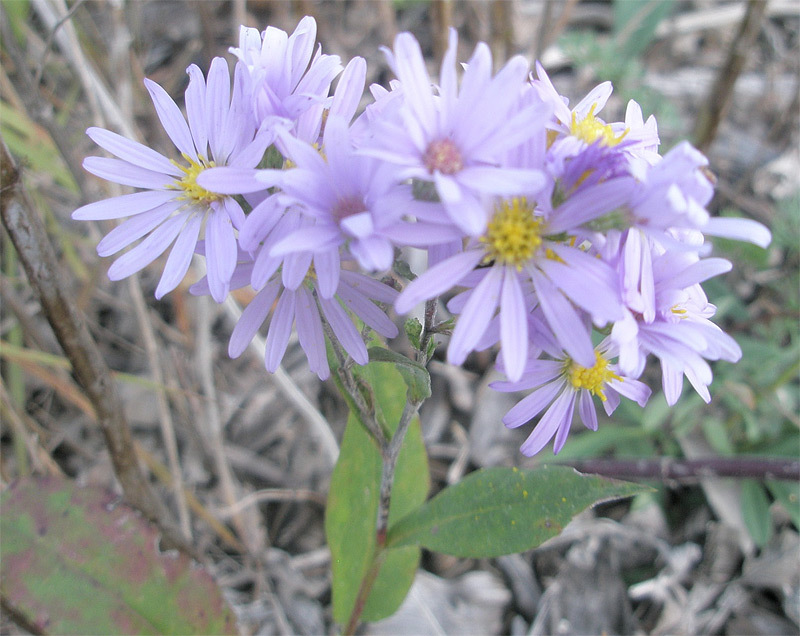 A most attractive and versatile prairie aster. Does well in a variety of garden settings. Grows 2 to 3 feet tall in very dry to slightly moist soils. Will tolerate light shade in dry soils. 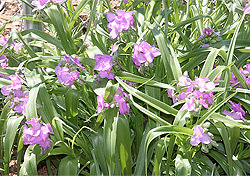 Spiderwort - Tradescantia ohiensis: The erect, slender stem of this colorful perennial is often branched and grass like. Dense showy clusters of blue flowers appear at the top of stem. 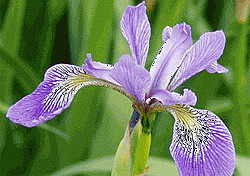 Each flower has three oval petals from ¼ to ½ inch long, overall flower is ¾ to 1 inch across. The flowers tend to open in the morning. When touched in the heat of the day the petals shrivel to a fluid jelly that trickles like a tear. 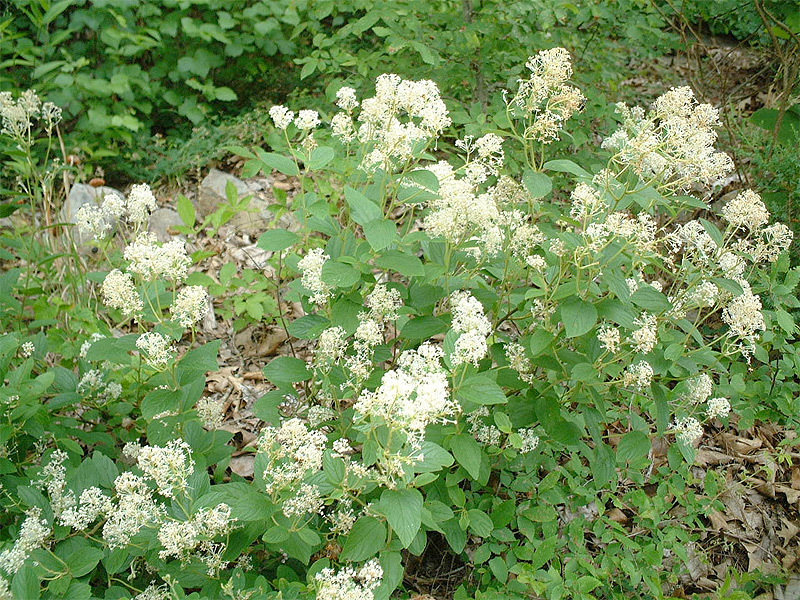 The plant was once thought to be a cure for spider bites, hence the common name. 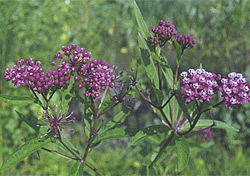 Swamp Milkweed (Red Milkweed) - Asclepias incarnate: Don’t let the name put you off, as swamp milkweed is a great plant. Its deep red to pink long-lasting flowers are clustered at the top of tall stems and emit an intoxicating fragrance of vanilla. Leaves are willow-like. Height average 2 to 4 feet, full sun. 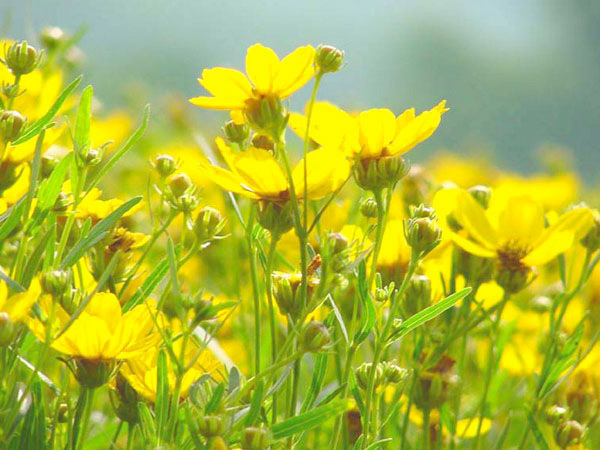 A plant of wet meadows, preferring moist conditions but will also thrive in average soil. 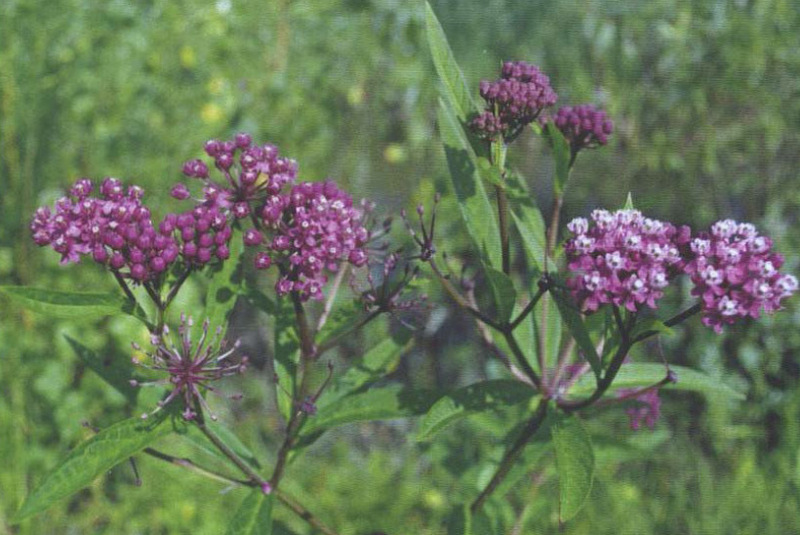 Swamp milkweed is also versatile with regard to nutrient requirements and pH, doing just fine in a wide range. Plants in the milkweed family are the only known larval food for the monarch butterfly; also larval host plant for the queen butterfly. Swamp milkweed attracts many different butterflies to its nectar. 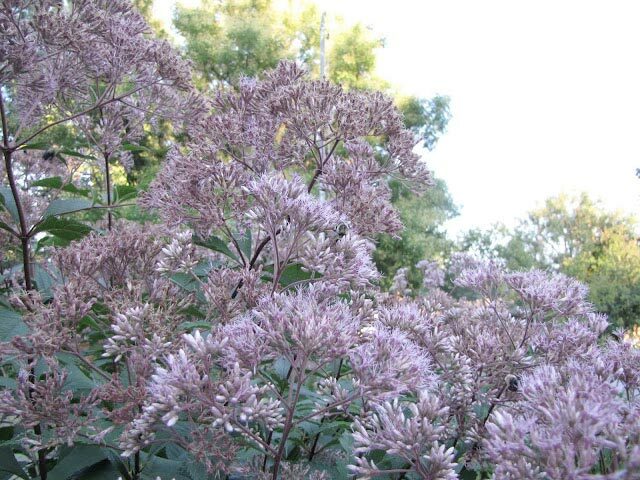 Good companion plants are tall meadow rue with tall billowy white flowers, boneset and New England aster. Sweet Black-Eyed Susan - Rudbeckia subtomentosa: One of the showiest and most rugged of all the Rudbeckia. 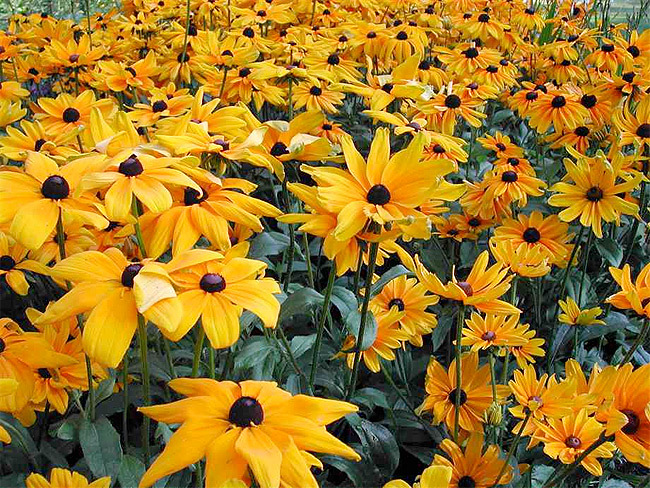 While many other plants fold in the heat of the summer, the variety of Black Eyed Susan effortlessly maintains its luxuriant deep green foliage. 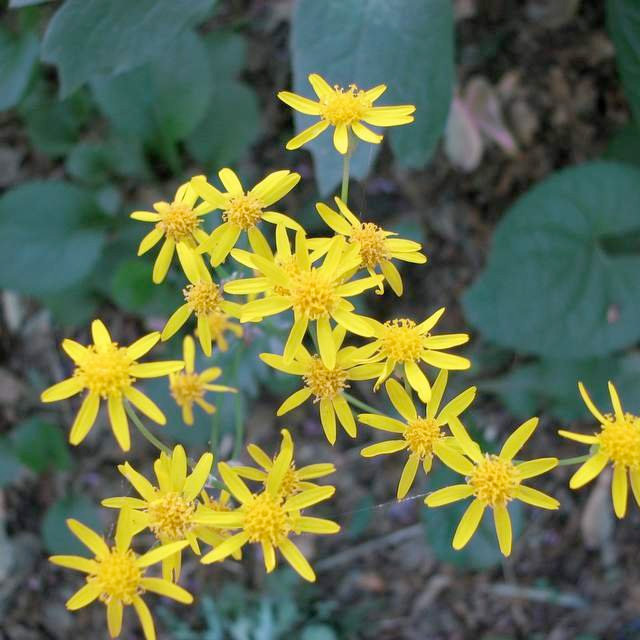 From August through October, it produces a plethora of butter-yellow blooms with shimmering reddish-brown centers. Growing 4 to 6 feet tall, adapting well to any reasonably rich soil, including loam, clay and rich sand. 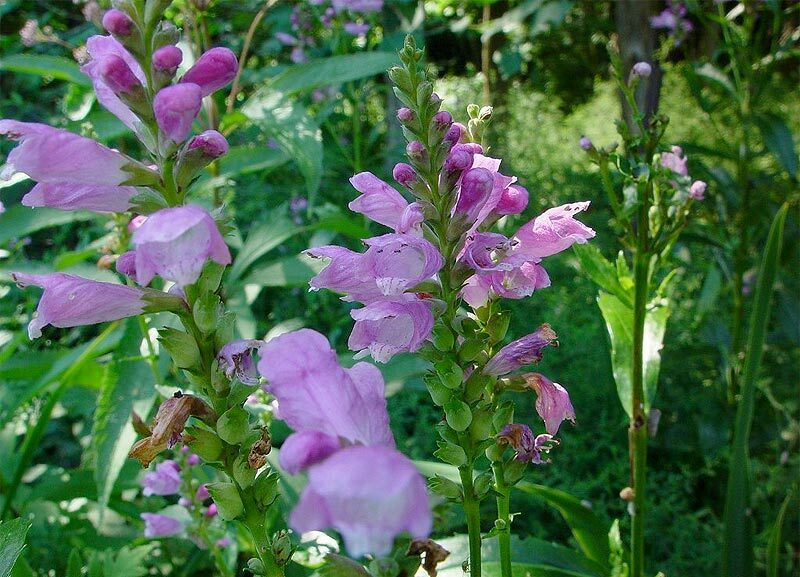 A strong perennial that is an outstanding plant that looks great in both the perennial garden and prairie meadow. 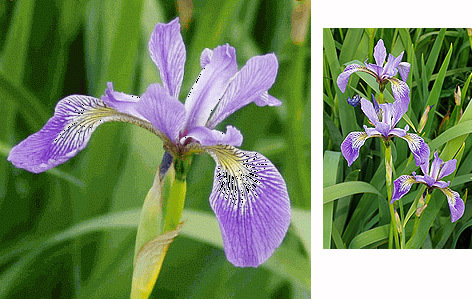 Wild Blue Iris - Iris versicolor: Veined violet-blue flowers on a sturdy stalk. Sward-like leaves 3 feet tall. Grows in swamps, marshes and wetlands Food/cover for waterfowl. Blooms May - August. Full sun to partial shade. 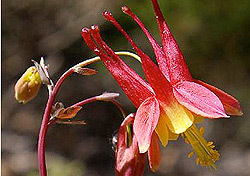 Wild Columbine - Aquilega Canadensis: The orange/yellow flowers are pollinated by hummingbirds. They have long tubes at the end of which are little storage places for nectar. The height is 1' to 3', blooming May - July. Grows in most soils, full sun to dappled shade. Do not over fertilize or you will get mostly leaves. Good for rock gardens. 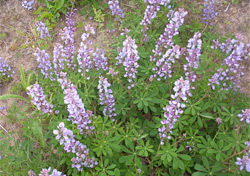 Wild Lupine - Lupinus perennis: This lupine will grow1 to 2 feet, blooming early summer. With typical lupine leaves and tall elongated cluster of pea-like flowers, the wild lupine is a lovely addition to the garden and a perfect focal point in early summer. As a legume, it fixes nitrogen in the soil. 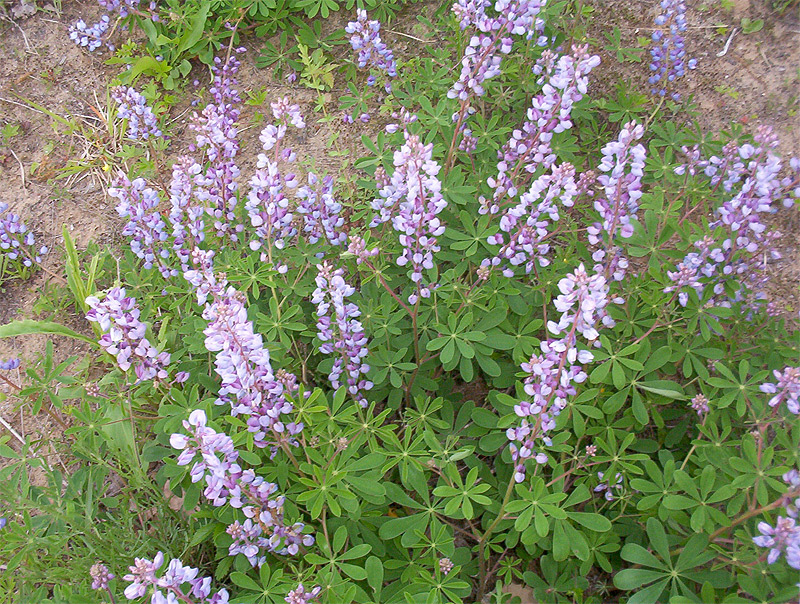 Wild lupine requires good drainage, but other than that, is a very versatile, growing in partial shade to full sun, slightly acidic to neutral soil, sand to heavier loam. 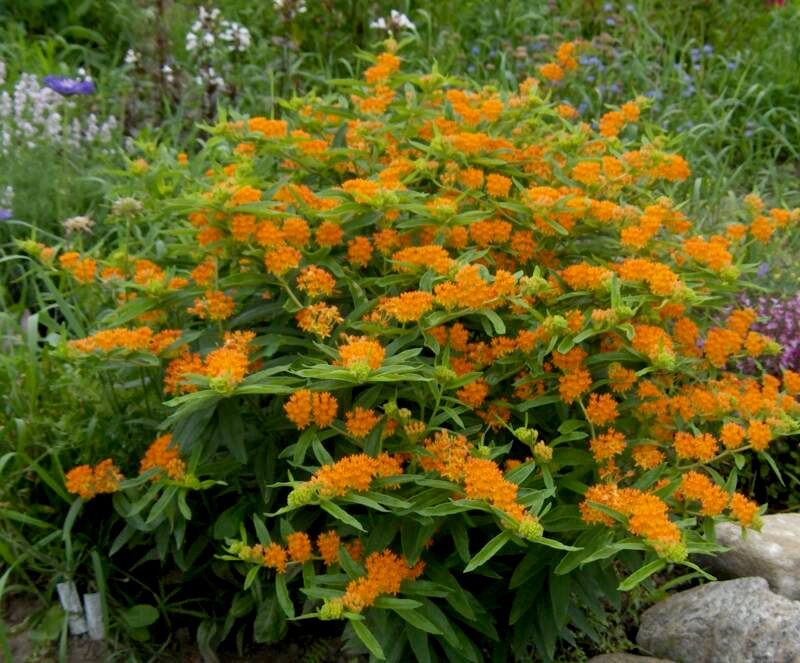 Good companion plants include butterfly weed and lance leaved coreopsis. This native species is larval host plant for many butterflies in the blue family including the endangered Karner blue, Common Blue butterfly, and Silvery Blue butterfly. Wild Petunia - A stout, multi-branched stem, normally growing less than one foot tall. Depending on the habitat, it may be so low-growing as to appear as a ground cover. One of several stems arise from a perennial, fibrous root system. 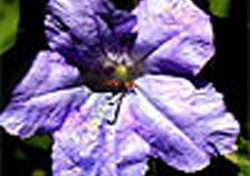 The showy flowers are petunia-shaped and vary from light lavender to purple. They are smaller and not as widely flared as the common cultivated petunia. Blooms from June to August. 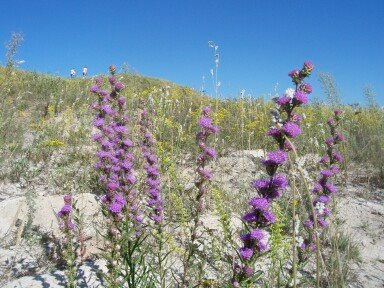 The native habitat is from open woodlands to moist prairies to sand plains. 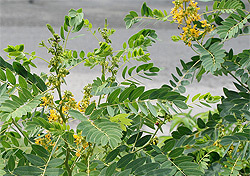 Wild Senna - Cassia hebecarpa: Found along roadsides and in thickets, open shade and full sun, and will do well in clay. 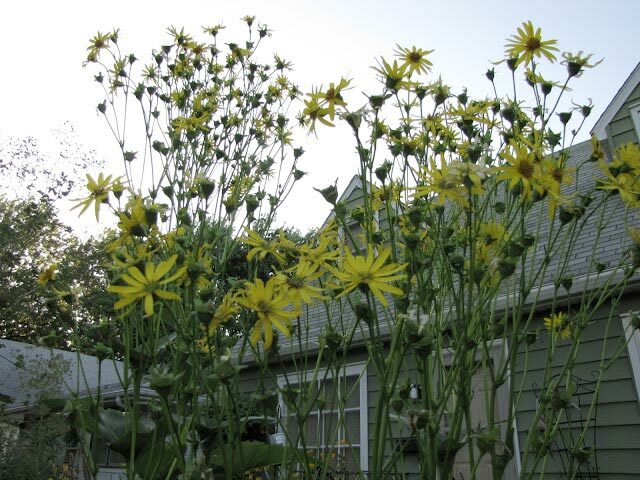 This perennial will grow 4 to 6 feet tall with 5 to 9 pairs of leaflets. 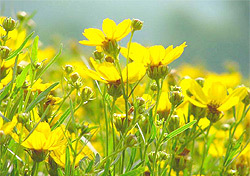 The yellow flowers grow in elongated flower clusters with short lateral branches that bear the individual flowers. 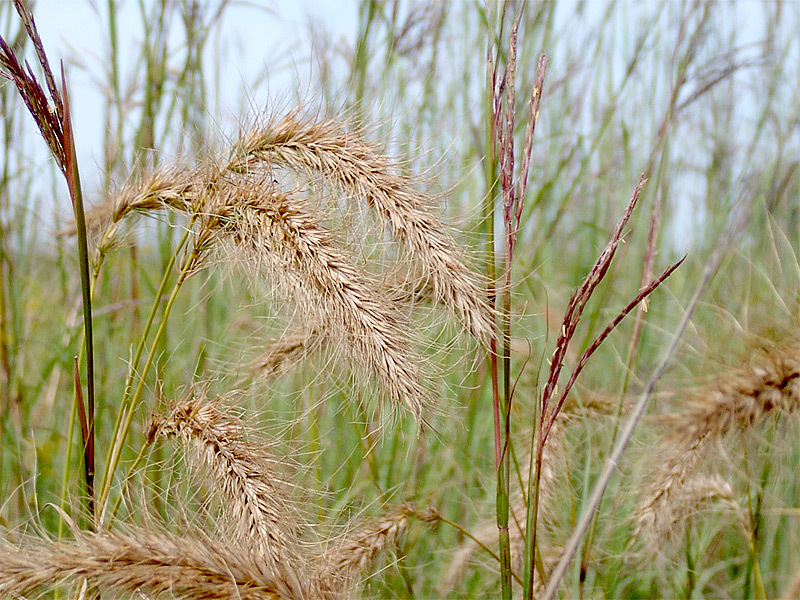 Its robust form provides cover for wildlife, while the large seeds offer a nutritious meal. 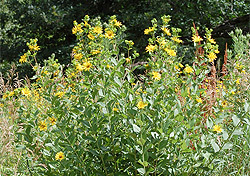 Bunches of bright yellow flowers appear in July and August. Woodland Sunflower Helianthus divaricatus: This is a very common sunflower in partly shady places. 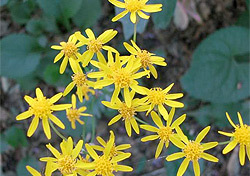 Showy yellow flowers are large 1-1/2 to 3 inches across that blooms July to October. Habitat is sparse woods, dry thickets growing to a height of 2 to 6 feet. 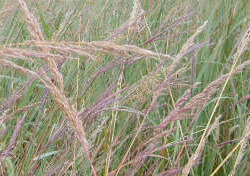 Big Bluestem Grass - Andropogon gerardii: The most prevalent and widely distributed of all prairie grasses. Growing three to eight feet tall, it thrives on a tremendous range of soils, form wet, poorly drained clay to dry open sand. In late August it produces its distinctive three-parted seed heads, which resemble a turkey foot. The lush green of the leaves and stems changes with the first frost to an attractive reddish-copper color that provides landscape interest well into the winter. Bottlebrush Grass - Hystrix patula: It is a bit unusual to see grass-like plants in the woodland garden, there are a number of grasses, sedges, and other grass-like species that do well in shade and should be considered by gardeners looking for something a bit different. Bottlebrush grass is particularly stunning when its gorgeous bristly seed heads are touched by filtered sun. Bottlebrush grass does best in well drained woodland soil, in the partial shade provided by a high canopy cover. Give it room to spread into a large stand. 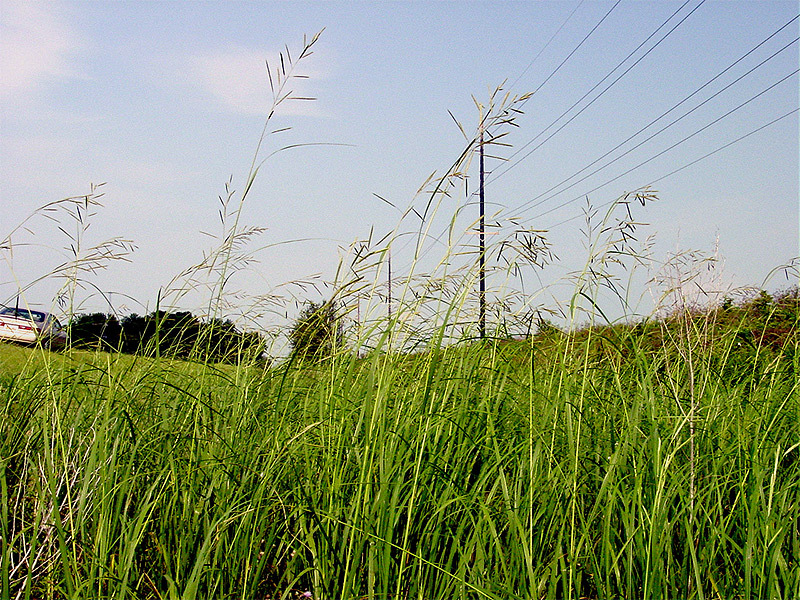 The genus name, Hystrix, is from the Greek for hedgehog, attesting to the spikey look of this grass. 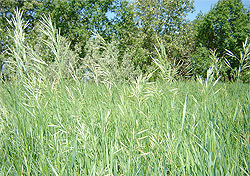 Canada Wild Rye - Elymus Canadensis: If you have a large bare area that you eventually want to return to prairie and you want to cover the soil quickly so the weeds can’t grow, Canada wild rye is a great ground covering grass to plant while you’re waiting for slower-growing species to get established. 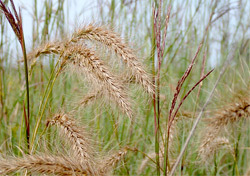 Flowers (a bushy inflorescence) are very showy – 4 to 10 inches long and looking almost like wheat. Seed plums turn gold as they ripen, nodding under their weight. A delicate-looking, airy plant, but extraordinarily tough. 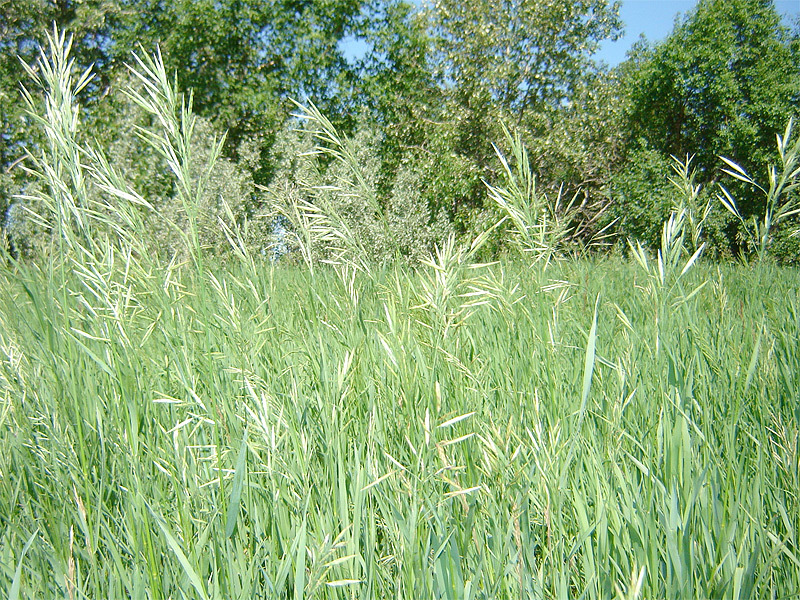 Canada wild rye is extremely versatile, growing in almost all soil types, form clay to sand, moist to dry, acidic to neutral. Requires no maintenance whatsoever. 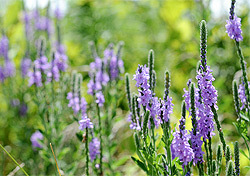 For ornamental planting combine with butterfly weed, white false indigo and prairie phlox. 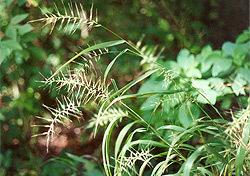 Indian Grass - Flower spikes stand 2 to 3 feet above the foliage. In August flower spikes turn tan/yellow. 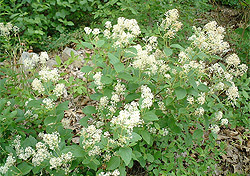 Clumping , warm season type with ½” wide leaves range from green to almost blue that branch off at an angle from the stems. Readily reseeds. Full sun, prefers deep rich loam but will tolerate a wide range of soils. June Grass - Koeleria macrantha June grass prefers dry locations and full or partial sun in sand, dry prairies, jack pine woodlands and oak woodlands. 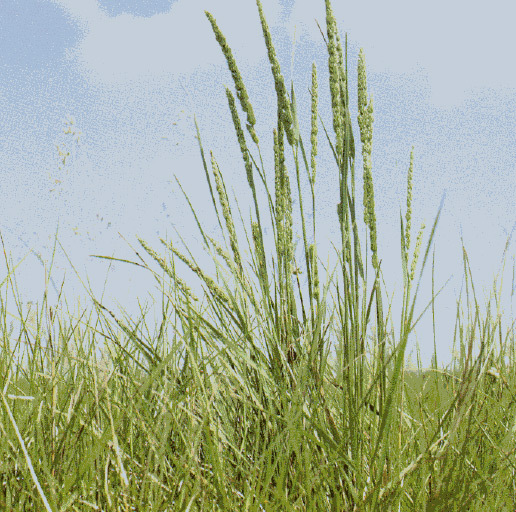 This is a hardy grass for difficult locations. 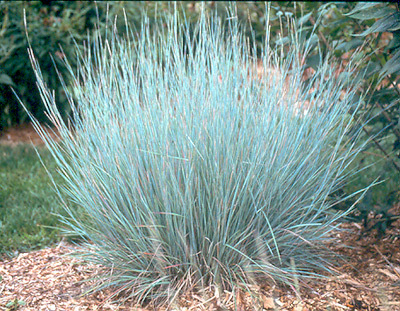 Its vertical blue-green foliage forms clumps that grown to 18” high. The flowers grow that much higher above the leaves in a cylindrical cluster that remains vertical and turns from glossy pale green to golden-brown as the seeds mature from June to July. 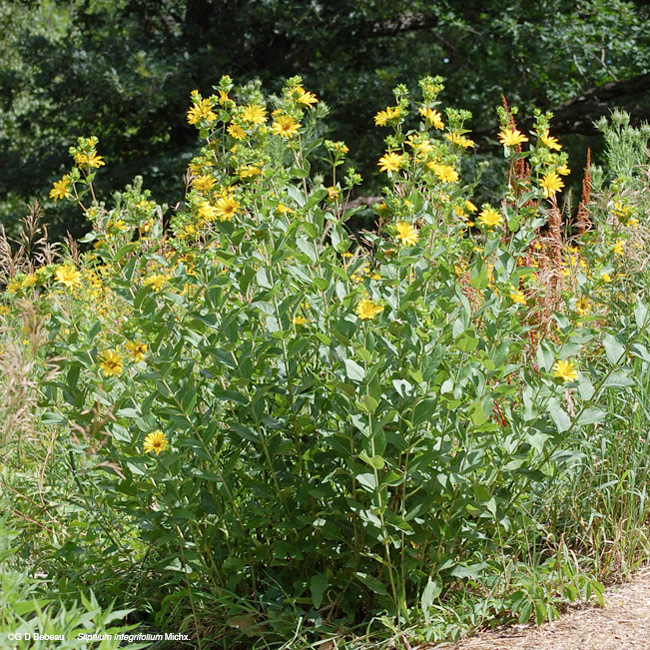 Consider this one for massing in dry gardens and for naturalizing large areas, or mix it in plantings with other native prairie grasses. 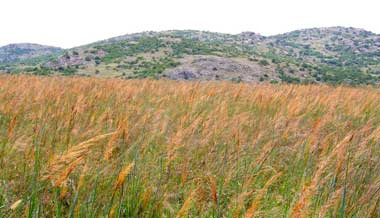 June grass can also provide effective cover for dry slopes. 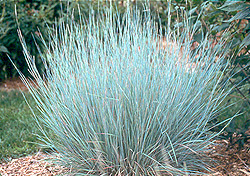 Litle Bluestem Grass - A popular ornamental grass used in a variety of landscape settings. 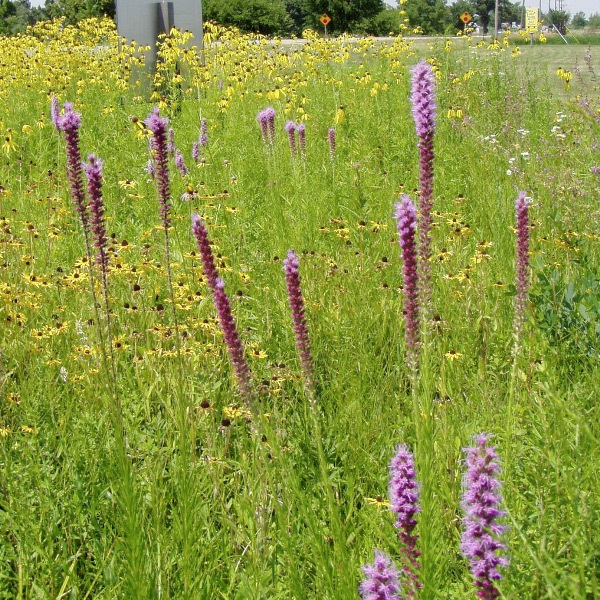 A clump-forming short grass combines will with native wildflowers. Coloration of the leaves ranges through blue and green hues, which complement one another. 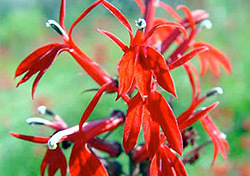 They turn a striking bright red in the fall and are topped by fluffy silvery white seedstalks. 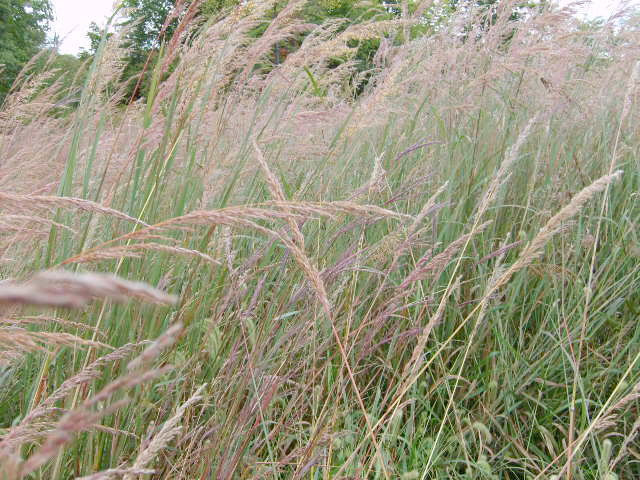 A patch of Little Bluestem waving in the wind is a truly wonderful sight. Grows best on well drained, medium and dry soils, that will sustain very few other plants reaching t to 3 foot height. Not recommended for wet or heavy clay soils. 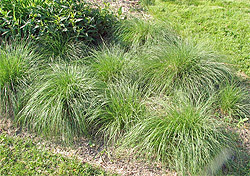 Prairie Dropseed - Sporobolus heterolepis: This grass produces a magnificent fountain of emerald green leaves, adding a touch of elegance to almost any planting. 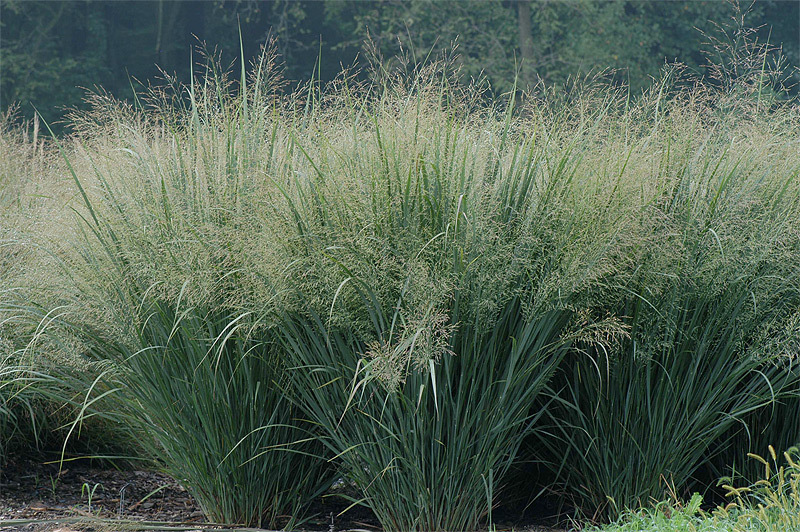 Often considered to be the most handsome of the prairie grasses, making a well-defined and very distractive border when planted 18 to 24 inches apart. 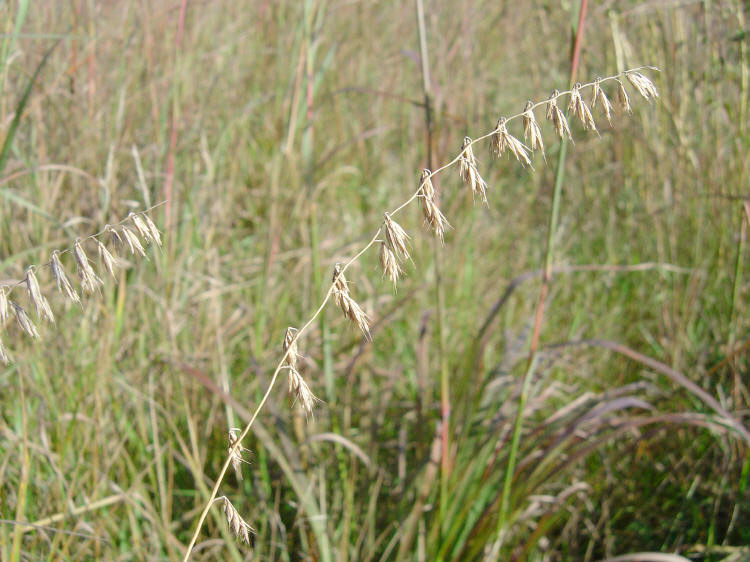 The seed head has a faint but unmistakable fragrance that can be detected by some people, but not by others. Plains Indians ground the seed to make a tasty and highly nutritious flour. 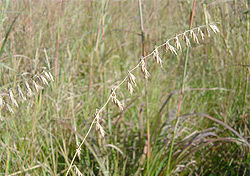 Side Oats Grama Grass - This grass grows 2 to 21/2 feet tall. 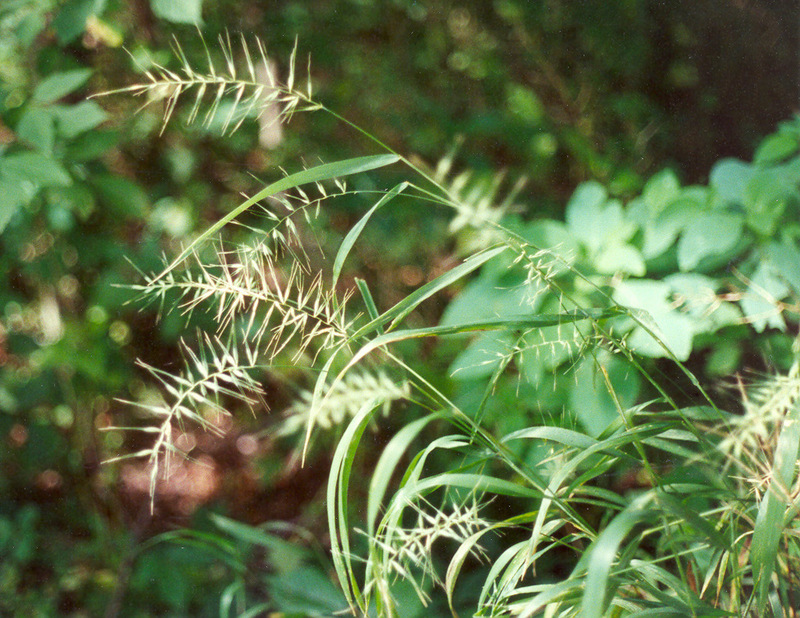 A creeping grass that forms a coarse mat of green foliage with 2 foot spikes of little oat flowers and fruits. The culms are light green in spring and later during fall, they become light tan. It prefers full sun and dry conditions. 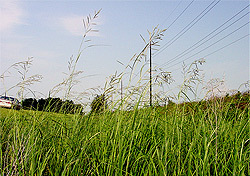 This grass grows readily in various kinds of soil, including those containing clay-loam, gravel, rocky material and sand. This grass is quite drought resistant. 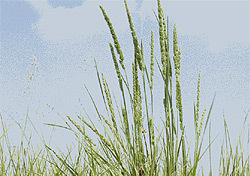 Sweet Grass - Wide bell-shaped flower clusters that can be tan, bronze or purple. Height is 1 to 2 feet. 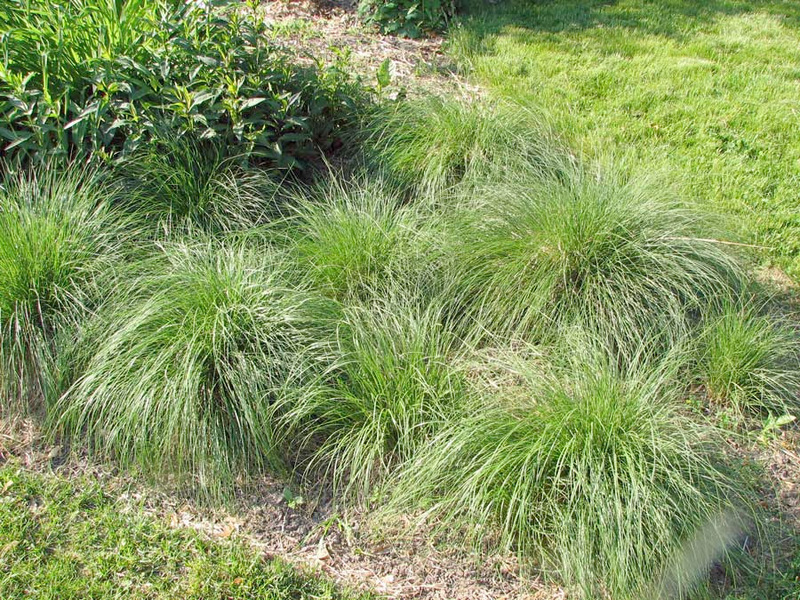 This cool seasoned grass is sometimes called “Vanilla Grass” because of the scent it emits. Full sun, tolerates partial shade, moist to wet soils.